Secrets for successful subheads - Wylie Communications, Inc.
What were the tips? I’ll never know. What if I told you there was a magic wand that kept readers reading and skimmers scanning — even after their attention begins to wane? Friends, there is such a tool, and it’s called a subhead. Subheads are important because they help skimmers get the gist of the message. But label subheads — those that classify the topic but don’t say anything about it — don’t communicate much at all. So instead of just labeling a section of your copy with the topic — “Mortgage services,” for instance, or “Tip. No. 1” — tell the reader something. What about mortgage services? What is Tip No. 1? Think of your subheads as the Roman numeral outline of your piece. What are your topics I, II and II? Those are your subheads. Listen. Don’t ask questions or seek details. 2. Don’t write ‘read below’ subheads. But there’s a reason they’re not reading. They’re skimmers! Instead of trying to force skimmers to read, write robust subheads that define the problem, solution and results. 3. Answer, don’t just ask, questions. If you raise a question in the subhead, answer it in display copy — a bold-faced lead-in, highlighted key words or a bulleted list, maybe. If your subhead asks, “Why subheads?” for instance, you might answer the question in a list with bold-faced lead-ins. Otherwise, your question is essentially saying “read below to find out.” And we know skimmers want to skim, not read. Bottom line: If you ask a question in the display copy, you need to answer the question in the display copy. Aim for eight words or less. That’s the number of words readers can get at a glance, according to American Press Institute research. And limit subheads to one line. Longer, and they’ll start looking like text, not display copy. And then you’ll lose the attention-grabbing power of subheads. Finally, don’t drop the subheads. It’s a poor communicator who ignores this power tool. Want more tips and techniques for reaching humans and Google with headlines and display copy for your blog post, e-zine or webpage? If so, please join me at Reach Readers Online — our three-day online-writing workshop on July 24-26 in Portland. 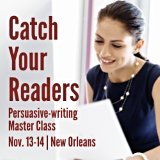 There, you’ll learn which how to reach even nonreaders with online display copy. Find out which 20% of the words on the page visitors are actually reading. Then learn to put your key messages where their eyes are.